Five “droplets” of turquoise almost glow against deep black primordial contours. Intuitive, organic, fresh! A powerful modern piece, especially worn close the the throat, between the collarbones. Simply stunning! To wear this piece is to feel powerful. A bold and classy statement. 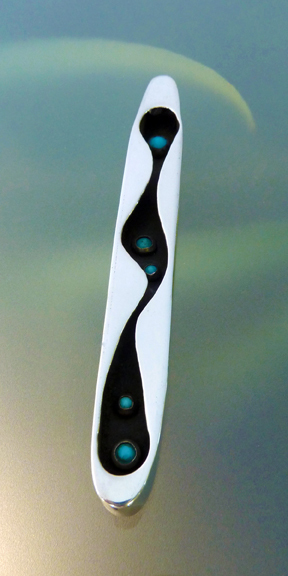 Fine and sterling silver, turquoise, hollow form shadowbox pendant. Hand-fabricated (made entirely by hand). Approximately 4 1/2 inches long, 1/2 an inch wide, 1/4 inch deep.